When John C. McConnell (Maghaberry, N. Ireland) set up his camera and tripod on his frosty back garden on Christmas Eve his intention was to get an image of comet Holmes to complete his nightly record of this icy visitor when he got a wonderful Christmas treat. Surrounding the waning full Moon was a beautiful example of a 22 degree Moon halo with vivid colours. He wasted no time in getting the above image using his garden trees to block the glare of the Moon. 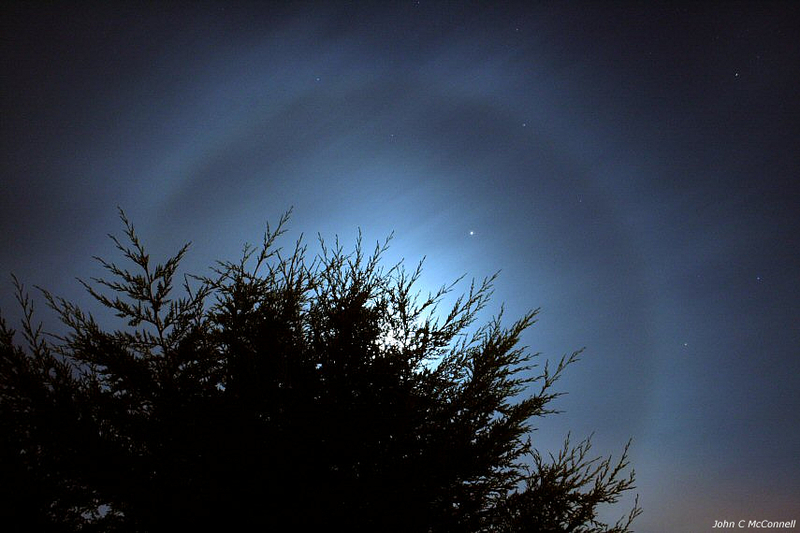 Haloes form when moon light is refracted by tiny ice crystals within high level cirrus clouds. When this happens the light gets split into its component colours similar to a spectrum produced by a prism. It's named the 22 degree halo because of the haloe's radius from the Moon itself. The complete halo was 44 degrees (88 Moon diameters) wide!. To get a shot like this you need a wide angle lens and a long exposure with the camera's aperture closed down to darken the background sky, enhance contrast and saturation. Why not give it a go yourself?, however there is one thing you cannot learn from a book and its creativity, so use your own imagination to compose your shot. Learn more about the science of haloes HERE.